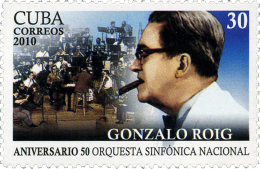 Gonzalo Roig (born Havana, Cuba, July 20, 1890 – died, Havana, June 13, 1970) was a Cuban musician, composer, conductor and founder of several orchestras. In 1902 he began to study piano, music theory and solfège and then later graduated in music studies at the Havana Conservatory. In 1907 he played part, as a pianist, in an ensemble (trio), and thus started his very active career in music, composed his first musical piece Voice of misfortune for piano and solo voice. Two years later he began playing violin at the Marti Theater in Havana. In 1917 he traveled to Mexico, and worked there briefly, returning to Cuba the same year. In 1922 he was co-founder of the Symphony Orchestra in Havana, of which he become Music Director. In 1927 he was appointed director of the Municipal Music Band of Havana. During his tenure as director (he held the position until his death) he made countless contributions to Cuban music. In 1929 he founded the Orchestra of Ignacio Cervantes which, a year later, was invited by the Pan American Union to lead a series of concerts in The United States of America. In 1931, while participating in the creation of the National Theatre, he composed and premiered (next year) his zarzuela, Cecilia Valdés, a typical example of the Cuban lyric theatre. It premiered in 1932 and continues to be one of Cuba’s most frequently-performed musicals. 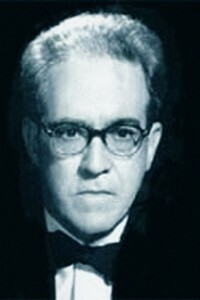 In 1938 he founded the National Opera in Havana, which he directed for a few years. He traveled frequently and gave performances in many parts of the world. He founded the Society of Cuban Authors, the National Federation of Authors of Cuba, the National Union of Authors of Cuba and the National Society of Authors of Cuba. Besides his Cecilia Valdés he was the composer of many popular numbers, such as “Quiéreme Mucho” (translated into English as “Yours”), among others.